This guest post is by #citylis student Wendy Durham. Here she writes about her work experience volunteering at the British Library Labs while doing her master’s degree in Library Science at #citylis. 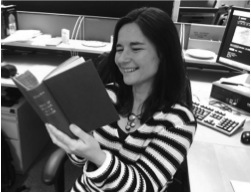 #citylis student Wendy Durham having a giggle at the ‘Book of Humour, Wit and Wisdom’ that she transcribed for the Victorian Meme Machine competition winner, 2014. I am a part time master’s student in Library Science at City University London, and currently at the end of my first year of studies. Having spent 20 years in both UK and international Primary Education, I am attempting a career switch to an area of LIS where I can use the transferable skills I have from my experiences within teaching and learning environments and hopefully thread together my roots in the arts. City University London does not require previous library work experience as a prerequisite, but my voluntary work at the British Library Labs project has been significant in making many module elements meaningful and focusing assignment choices on ‘real’ practice. For me as a complete beginner to LIS, having this context has been essential. I would strongly advise anyone in a similar career change position to consider either a graduate traineeship or seek entry level / voluntary part time positions to complement the course. The British Library advertise vacancies and internships on their career website pages and standard vacancy listings. For a more prospective approach, try checking the Library’s current developments within its different departments from the regular blogs and enquiring politely by email what opportunities could be available. One of the best ways to network is getting along to the Library events or BL Labs events to engage with staff. During my time volunteering with Labs, I have mostly been involved in the ‘opening up’ access process. My responsibilities have focussed on using filtering criteria to ascertain which collections hold most potential for investigating with regard to the challenges of access and copyright. Upon selection, I have initiated research and contact with collection curators to build a background narrative in preparation for a department presentation and review for publication. I joined Labs a year after the Flickr 1 Million release, just as the project was approaching its first anniversary and reaching some intriguing developments such as the mass algorithmic tagging of maps by the prolific coding wizard and artist Mario Klingemann (Qusaimondo) and the striking reuse of the images by collage artist David Normal, (exhibited for the 2014 Burning Man Festival, now set for being showcased at the British Library). You can follow Wendy on Twitter @wendydurham2. You can follow British Library Labs @BL_Labs. This entry was posted in Student Perspectives and tagged British Library, British Library Labs, careers, Internships, Library Science, students, Work Experience. Bookmark the permalink.